NEW ORLEANS—After the smoke cleared from conference weekend, six league champions earned National Athlete of the Week honors, announced Monday afternoon by the U.S. Track & Field and Cross Country Coaches Association (USTFCCCA). Five of the six came from programs that are no strangers to having a national honoree, while ACC champ Liv Westphal is the first-ever AOTW from Boston College. Like Westphal, Edward Cheserek of Oregon knocked off several big names to defend his title at the Pac-12 Championships, continuing his undefeated sophomore season. In Division II, Henry Cheseto of Alaska Anchorage and Katelyn Steen of Western Washington won the GNAC meet. The traditional powerhouse conference was the only big DII meet of the weekend. And in Division III, Josh Thorson of UW-Eau Claire and Lucy Cheadle of Washington (Mo.) led their teams to historic victories. All six resume competition at their respective regional championships. DI regionals are Friday, November 14; DIII regionals are Saturday, November 15; and DII regionals are Saturday, November 22. Click each of the student-athletes names above or keep scrolling below to read about the exploits that made all six worthy. 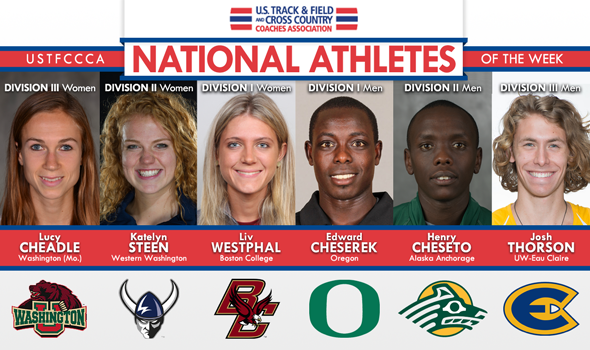 National Athlete of the Week is an award selected and presented by the USTFCCCA Communications Staff at the beginning of each week to six collegiate cross country athletes (male and female for each of the three NCAA divisions). On Halloween morning in Oakland, there must have been nothing spookier than a King lurking over your shoulder for half the race. For 5000 meters at the Pac-12 championship, Cheserek sat with the pack—even letting a runner or two break free briefly—before making a move that instantly ended the race. He ran his last 3k in a scary 8:23, finishing in 23:22.2 – a full 11 seconds better than runner-up teammate Eric Jenkins. Along with Steve Prefontaine and Jim Hill, Ches becomes the third Oregon runner to win back to back PAC titles. (Galen Rupp won the conference in 2006 and 2008) His winning surge contained several signature peeks back. Liv Westphal was the second returner in the ACC this fall, behind Florida State’s Colleen Quigley. On Friday morning in Virginia, Westphal overtook Quigley to win in 19:43.8, setting a Panorama Farms course record on Halloween. With an ESPN3 login (free on college campuses), you can watch a full replay of Westphal’s win here. She won by 14 seconds on the strength of a serious move at almost exactly 3000 meters into the race. The French senior has only lost one race this fall, taking fourth at Wisconsin. She’s the sixth-best returner in the NCAA from a year ago (17th in Terre Haute) and has beaten two of the five women ahead of her. Cheseto gave the Anchorage Seawolves their seventh straight GNAC conference individual champion on Saturday, sending a signal that he’s going to be a serious player on the national scene. He crossed the line on the 8k course in 24:35.91, six seconds clear of teammate Dominik Notz. It was an impressive 8k debut for Cheseto. The freshman has raced four other times this fall, winning three shorter races and losing to All-American teammate Dylan Thomas in a 10k three weeks ago. The Seawolves have won 14 straight conference meets (dating back to their days in the PacWest) and have not lost a meet yet this season. Katelyn Steen easily dispatched the rest of the GNAC, winning Saturday’s race by nearly 20 seconds in 20:13.75 over 6k. She lived up to her top returner billing after finishing second in the conference a year ago. Her Western Washington teammates were part of what might end as the team race of the year in the entire NCAA. First-place Simon Fraser won the meet with 62 points; Alaska Anchorage was second with 63; and WWU took third with 64. Steen took fourth in the steeplechase at outdoor NCAAs and was 34th at cross country nationals last year. She’ll look to improve upon that finish in a month. Josh Thorson took home dramatic individual and team hardware at Saturday’s WIAC championship, covering the 8k course in 24:24.5 – winning by seven seconds. He led his UW-Eau Claire teammates to the school’s first conference title since 1980. And Thorson’s win comes on the heels of losing to at least one WIAC runner each time he raced conference competition this fall. He sat with leaders for three miles before scattering the field with a 4:42 fourth 1600; overall, his last 3200 meters was covered in a stellar 9:32. Thorson (a Minnesota transfer) and the Blugolds knocked off defending conference champions UW-La Crosse on their home course. Lucy Cheadle is now 3-for-3 this fall: each time she’s spiked up in 2014-15, she’s won Athlete of the Week. The third honor comes after winning her third UAA title in a row (the first male or female to ever do so) at home on Saturday. Her winning time of 20:31.6 over 6k was 47 seconds faster than every UAA winning mark ever. Racing on her home Forest Park Course, Cheadle won by 82 seconds with a 6:38 last 2k. She hasn’t lost a race longer than 1500 meters since the NCAA indoor 3k on March 15, 2014. Since then, no one has come within 7 seconds of her in a track or XC race longer than 1500.